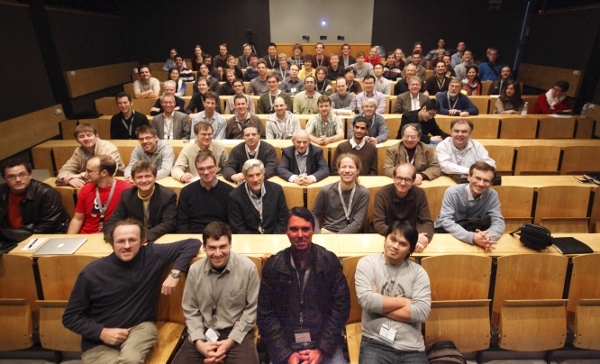 This is a group picture we took in Tuebingen during the symposium. In 2011, Vladimir Vapnik turned 75 years old, and we celebrated this event with him. We organized a symposium 'empirical inference' in his honour in Tübingen. The symposium run from Dec 8 through Dec 10. The first two days consisted of talks given by scientists from statistical learning theory and kernel methods; the third day featured talks of alumni from the empirical inference department. Note that on Monday Dec 12, the NIPS conference took place in Granada (www.nips.cc). Please feel free to mention this event to people who you feel should know about it - people who have worked with Vladimir, who have been his friends, or whose work has been influential to him and his field of research. Please direct all email correspondence to empirical.inference@tuebingen.mpg.de.